- The World of Famous Diamonds - Gemstones, The Crown Jewels of Great Britain, the Hope Diamond, the Dresden Green Diamond, the Tiffany Yellow Diamond, the Great Chrysanthemum Diamond, the Orlov Diamond, the Chalk Emerald ring, the Star of Africa, the Cullinan, the Mouawad Group, Tiffany and Co., Russia, Catherine the Great, Elizabeth II, Elizabeth Taylor, the Kimberly Diamond, the Sancy Diamond, the Oppenheimer Diamond Crystal, Hope Diamond replica, loose Dresden Green Diamond, the Golden Jubilee, the Eugenie Blue Diamond, the Sultan of Morocco, the Transvaal Blue Diamond, the Taylor-Burton Diamond, Harry Winston, McLean, Prince Gregory Orlov, the Wittelsbach Diamond, World's largest cut diamond, green diamond, pink diamond, yellow diamond, blue diamond, brown diamond, champagne diamond, cognac diamond, Gemcad, colorless diamond, flawless, internally flawless, VSI, VVSI, De Beers, Premier Mine, Florentine Diamond, Incomparable Diamond, the Red Cross Diamond, the Eureka Diamond, the Star of South Africa, the Ahmadabad, the Premier Rose, The Golden Jubilee, Golden Jubilee, Agra, The Archduke Joseph Diamond, Porter Rhodes, Taj-E-Mah, Darya-I-Nur, Nur-Ul-Ain, rose cut, Tereschenko Diamond. GIA has published an article in "Gems & Gemology" discussing the so-called Ruspoli Sapphire and its confusion with a separate, cushion-shaped sapphire. Here's something new: I have made estimates for the measurements of two famous diamonds - the Blue Heart and the Porter Rhodes. I don't know their actual measurements, but I am researching it. I am going to post my estimate here and see how close I am (or not) to being correct. The Porter Rhodes is an modern Asscher cut stone, which means its width and length are equal or very near to it. I doubt the stone is going to be indentical in length and width down to the hundredth of a millimeter, but it will be fairly close. The stone is very well cut. In 2004 I was contacted via email, and in the email there was a link to a website discussing the cutting of this diamond crystal, weighing 292.86 carats, being billed as the largest rough green diamond in the world. 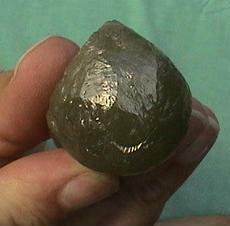 A single crystal with a pale green coloration it displayed outwardly a turbid appearance, although stones from the alluvial diamond fields of Zaire, such as this one, sometimes contain a transparent inner core. He told me the stone was mined in the 1970s. The party handling the faceting of the diamond were interested in making a documentary of the process. Cutting started in early 2005, and it was intended to first have the diamond cut in two by laser. As there are no facilities to do this in the Great Britain (or at least, at that time), where the stone is being held, the sawing was carried out in Antwerp, Belgium. Afterwards it was cut and polished in London. Unfortunately the website's link to a section discussing the diamonds in depth no longer works and the diamonds themselves, unfortunately, were not of typical gem quality. Not all was lost, however-- the stones are along the lines of translucent "icy" diamonds which have been popular in high fashion jewelry in recent years. 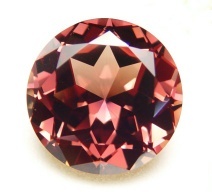 This 52.36-carat sapphire came up for sale recently at www.unicorngems.com The stone's color in the photograph is close to the true color but this does change considerably, to a deeper red, depending on the nature of the light, although perhaps not strongly enough to be called a color change sapphire. The stone, described as 'sherry-colored'. This stone was was found in 1975 at the Reward gemfield near Rubyvale in Queensland, Australia. Eight years passed before it was cut into the round brilliant seen here. There is a small piece left of the original rough stone, only one gem was cut from the rough. 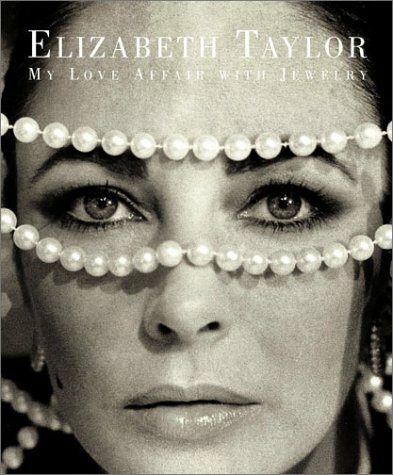 Elizabeth Taylor's book My Love Affair With Jewelry. I got this as a Christmas present for Christmas, 2002. Its great! This website was compiled by myself, Ryan Thompson, and is for educational purposes only! I don't make any money from this website, and never intend to. My goal is to try and archive images of all the world's most famous gemstones and diamonds, so people online can look and read about them freely. ^Since Andalé crashed and their website is a mess, I had to get a new hit counter. While editing the page on September 10th, 2006 I saw the hit counter had crashed. The number above is a guesstimate of how many hits I've had over the past few years.